The 1914 Detroit Priscilla Electric car, a very cute and successful electric car for its time. 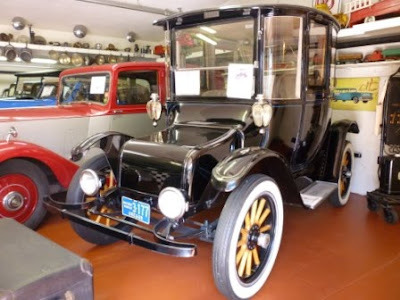 These cool electric cars were made from 1907 to 1938 by the Anderson electric company and was powered by a rechargeable Edison storage battery which was rechargeable, which were both lighter than lead acid batteries and long lasting. The car was marketed towards women and doctors of the day and with good reason. This was a great vehicle that didn't require to started by hand crank and the driver did not need to master choking skills either. 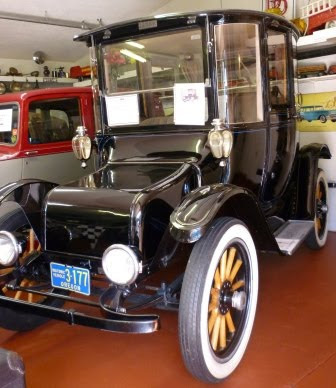 This car was produced during the companies peak in the 1910s. In fact the car was so popular that the name of the company was changed to the Detroit electric company. 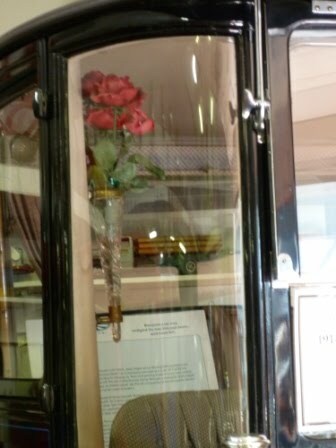 The beauty of the Detroit Priscilla's china cabinet like body is one of the things that it is known for. 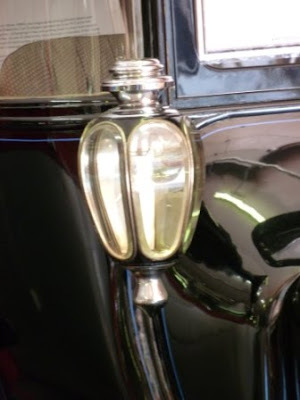 The car also featured a flower vase and lantern shaped headlights which I really like. This is known as one of the most successful electric cars of its time. Its top speed was about 20 mph and it was advertised to get at least 80 miles on a single charge. It's slogan was: " ... it will take you anywhere that an automobile may go with a mileage radius farther than you will ever care to travel in a day." Unfortunately things for the gasoline powered car improved and with these improvements the electric car became obsolete. The Detroit electric company while filing for bankruptcy in 1929 actually made it through the depression years but closed up shop for good in 1938. However, the good news is that these beauties are still around to this day so that people can still see and admire their beauty. I hope you have found this blog post interesting and educational. Thanks to the LeMay Car Museum for the information on this little beauty. 'Till next time have an amazing day everyone! 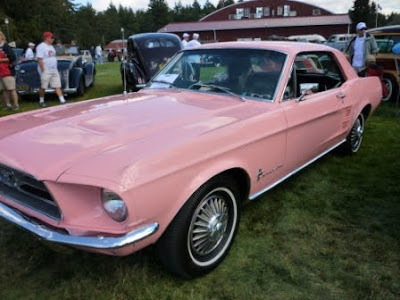 The Ford Mustang, in my mind is one of the "famous" cars out there. 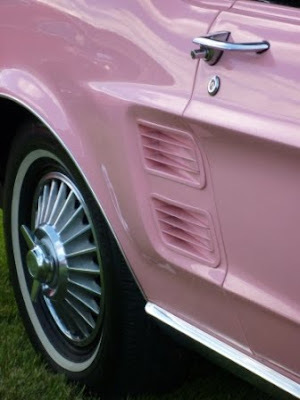 It is a very popular car and started on being on the market in early spring of 1964. 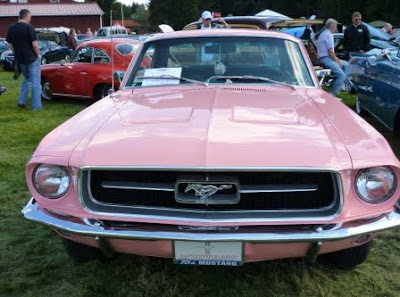 It was a beautiful car and was fairly inexpensive. 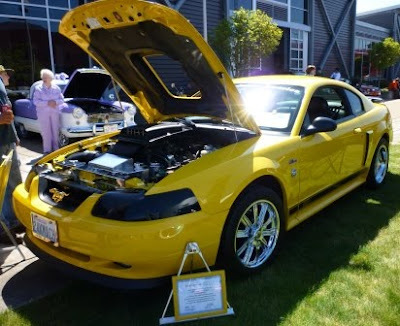 The popularity of the Mustang caused many others to mimic it thus creating the different "pony" cars - Finally that mystery is solved, when I first started at the LeMay Museum at Marymount I had wondered what a "pony" cars was and how they had come about. Now I know. One of the famous mustangs were the 1969 Ford Mustang Mach 1 which had such a built a such a big engine that it had what was called a shaker scoop (much like the one on the mustang below) which was part of the engine that extended through the hood of the car and shook when the car idled. 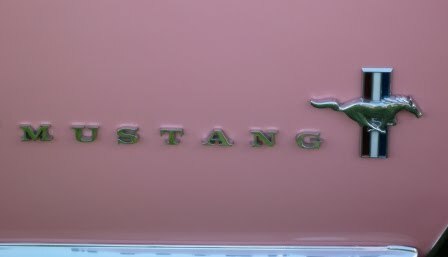 Personally I like the older Mustangs from the 1960's once the "fox body" was introduced ( I really wish I had a picture to show as a example but I don't) the Mustang seemed to go down in design and seemed to blend in with so many other cars' body designs afterwards in my opinion. 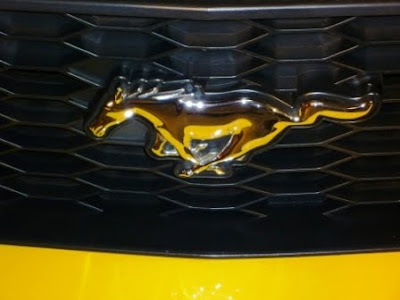 Some more of the Mustang's characteristics were a long hood and a short back end. One of the really cool things about the Ford Mustang from 1965 to 1970 was that the former race car driver designed the Ford Shelby Mustangs.This is something new to me as I thought the shelby cars were a totally different car altogether. So I hope enjoyed this interesting but short post. 'Til Next time have a amazing day everyone! 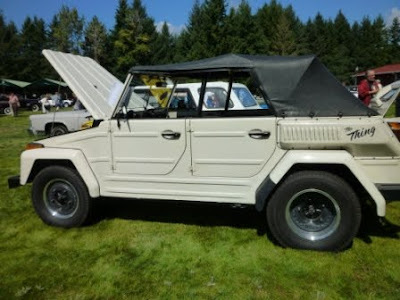 The Volkswagen Thing aka the Volkswagen Safari,Volkswagen Trekker and the Volkswagen Type 161 or Type 162, based on where a person is and where the car is from. Unfortunately the Thing has gotten some bad publicity, in my mind as a ugly car but I really don't think so. I think its cool and different. Now maybe if I rode in it I would think differently but for right now I stand by the vehicle and say, "Hey that is a cool car!" - at least in design. The car was actually made after a military vehicle called the Kübelwagen: Kübel meaning bucket and wagen meaning seats which makes since that is what the car has. Fascinating fact is that the vehicle's doors and windows are detachable and interchangeable! 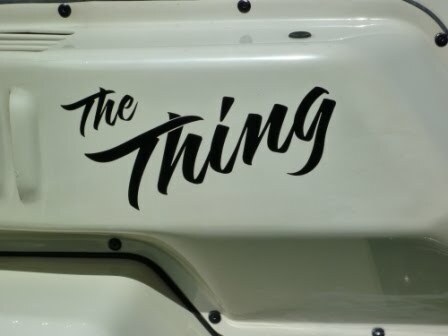 The convertible models of the Thing were only sold in the United States. 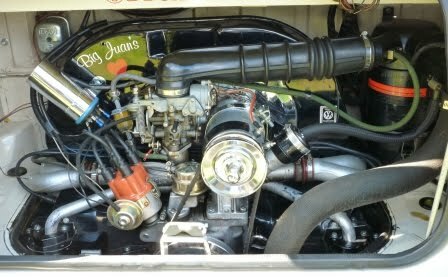 It was built on the same chassis as a pre -1968 Volkswagen Microcbus. A chassis, for people like myself that didn't know until I looked it up is the skeleton of a motor vehicle consisting of a steel frame supported on springs that holds the body and motor. Looking back at the car show I really wish I had taken a peek inside the car's interior. It was suppose to be so bare and "stripped" that Volkswagen advertised that one could hose out the interior! The way that the car was heated was through a gasoline fueled heater that was hooked up right to the engine and the heater was optional. It had a four cylinder engine and the only option for transmission was a four speed manual transmission. Just another reason why I should learn to drive a stick. However, the Thing wasn't known for its speed either - it would go from 0 to 60 in 23 seconds, not so great. Overall the Volkswagen Thing to me is a pretty cool little car and I hope to learn even more about it along the way. 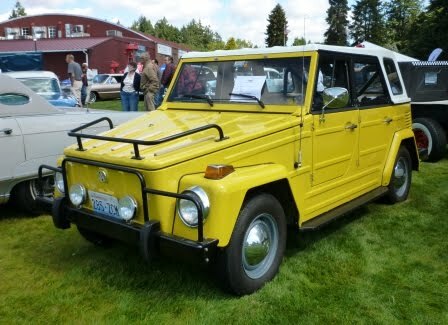 It you are interested in more Volkswagen Thing history I found a great website, the Jacksonville VW Thing website. Its chocked full of information on the Thing that I couldn't possibly squeeze into my blog. Click here for the link for the history pages of the VW Thing on their website. 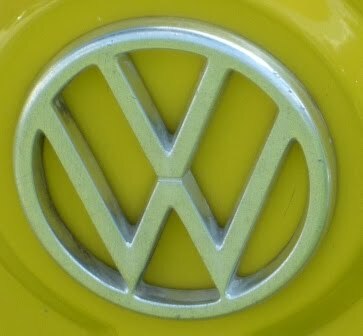 They are also a cool resource for the history of the Volkswagen company as well. I hope that you enjoyed this blog and found it to be entertaining and enlightening.